CPS provides a low cost, high speed deposit preparation device in your back office that images and transmits every paper check (personal, business, traveler’s, cashier’s, money order, etc.) for processing through the Federal Reserve. Within 48 hours you’ll receive a consolidated deposit to your treasury account from the ACH system. You won’t have the hassle of going to the bank or dealing with returns. EZ Deposit does not interfere with any Point of Sale process because it operates in the back office. In fact, EZ Deposit compliments your check authorization process by providing an electronic audit function that reconciles each check accepted, authorized and deposited on a per store basis. Exception reports can therefore be created for audit and loss prevention investigation and action. For the first time, check writers can be identified, tracked, and reported. 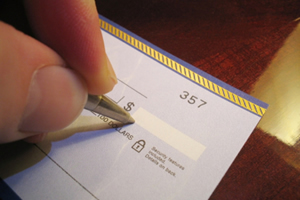 EZ Deposit has the unique advantage of specifically identifying the name and address of every check-writing customer. Honest check writers will now be your largest “known” customer population. You can create a tracking database to accumulate the date, time and amounts of every purchase made by the checking account holder on a global basis. This information will be returned to you or we can provide you with a subscription based enhanced marketing service that identifies your “best”, “infrequent”, and “lost / at risk” customers on a monthly basis. This is a very valuable marketing tool for increasing profits.